The 1972 season started with more than the usual difficulties, with the SCCA turning down RJ Reynolds' Winston cigarettes as a potential sponsor and then having trouble getting race promotors on board. An extensive field was expected but with very small prize money on offer, many top competitors changed their plans. 1971 champion Allan Lader was expected to do a full season but after dominating the opening round, went F5000 instead. The rest of the planned seven-car Fred Opert team also largely vanished: Bert Hawthorne never appeared, Nick Craw only did two races and Raul Perez Gama only did the two Bogotá races in February and March. Instead, Bobby Brown raced for the Opert team and won the Bogotá series and later scored a dominant win at Lime Rock in his Chevron B20 - the only championship race he finished. 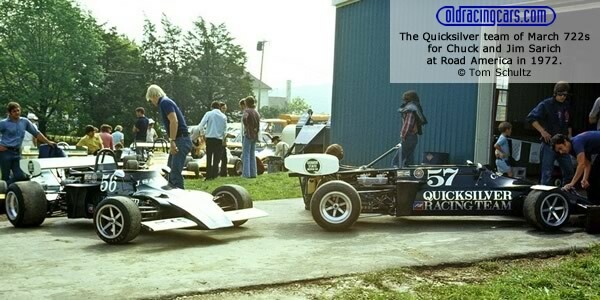 Leading the completely unheralded Quicksilver team from Virginia, Chuck Sarich was blessed with the best reliability in his March 722 and although he only won one race, his four second places propelled him to the title. Brother Jim also won one race. The other top March 722 drivers to do a full season were 1971 FB national champion Bob Lazier who won at Bryar Raceway and Tom Outcault who picked up enough placings to pip Lazier for second in the title race. The works-assisted new GRD B72 of Dave McConnell was very quick but too unreliable to threaten for the title. However, the Canadian did take pole at the last four races and won the last two of them. The final win was taken by Gordon Smiley in his Merlyn Mk21 who won at Road Atlanta and was second at Elkhart Lake in his only appearances. The championship table is from The Story of March p237 which gives the top 6 and from which the use of a 20-15-12 points system can be deduced. The inability of the SCCA to find a sponsor for the series did not come as a surprise to many, and was another symptom of the SCCA's inability to promote its racing. The end-of-season Runoffs themselves were well promoted and had a sponsor, but the 50 or 60 SCCA Nationals during the season were largely invisible, with the only real exceptions of the Road America June Sprints and the equivalent Olympia Sprints held at Laguna Seca. The problem was highlighted by Bob Tullius's Group 44 operation which had run cars in several Production categories for a decade and in 1972 was backed by British Leyland and by Quaker State, so had a product to promote. When trying to promote Group 44's presence at Cincinatti Region's National at Mid-Ohio, one of the biggest in Central Division, they were told by the Region that they had no interest in promoting the event as the Region made its money from entry fees and it was the circuit that got the gate money. This self-defeating approach meant that SCCA Nationals were quickly disappearing from view as the better-promoted IMSA and NASCAR events crowded them out. Another factor for Formula B was that manufacturer support was key at this time, and it was no coincidence that Formula B, largely ignored by Ford, was dying out as a Pro series just as Formula Super Vee, backed enthusiastically by Volkswagen, was expanding to fill the gap. Mike Hansen retained his NorPac title for the third year and Jim Grob in SEDiv for the second time. Both Ken Duclos in NEDiv and Mike Hall in CenDiv regained the titles they had won in 1970. In 1972, a competitor could count their best six finishes of the year, including no more than two out-of-division races. The results here have been compiled by using an end-of-season SCCA press release plus entry lists from race programs where available. The results are complete and although qualifying positions are known for every race except the Bogotá races and Lime Rock 4 Jul, qualifying times are not known at all. Entry numbers are missing for Bryar 29 May, Lime Rock 4 Jul and Watkins Glen 13 Aug. Please get in touch if you have any programs from these races.